Today the Beef Checkoff Program, in partnership with the American GrillMaster Experience, announced the kick-off of a nationwide grilling tour taking place at Sam’s Club National BBQ Tour events. Using beef grilling demonstrations, product samples, recipes and other checkoff-funded resources, the American GrillMaster Experience educates and informs consumers about the value and benefits of cooking with beef and grilling techniques. A total of 30 events covering 25 states are slated for the 2013 tour, which runs from March to November. Events will take place at Sam’s Club® locations, as part of the Sam’s Club National BBQ Tour, which is the largest Kansas City Barbeque Society (KCBS) sanctioned competition series. 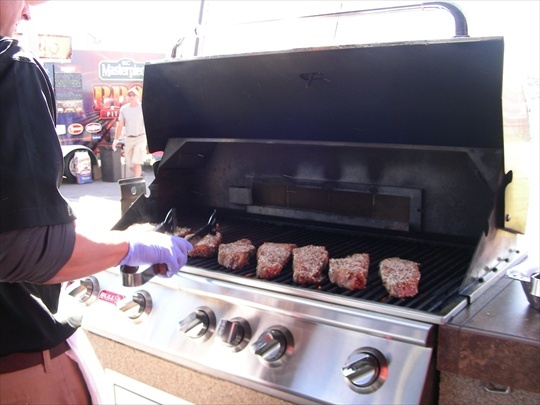 The Grill Master’s samples are sourced from premium quality Sam’s Club beef, which has a 200 percent freshness guarantee. In 2010, Sam’s Club launched a pilot competitive barbecue program and became the first major retailer to sponsor KCBS, the largest and most respected barbecue sanctioning body in the world. From that pilot program, the Sam’s Club National BBQ Tour was born. During 2011, the inaugural tour became the largest competitive barbecue series in America, and in 2013, the extremely popular competition series will award a whopping $500,000 in prize money. Click here to view the GrillMaster events schedule or visit GrillMasterTour.com.